The South African labour market is characterised by sharp segmentation, high unemployment and apparently limited informal sector employment. Recent work has focussed on the importance of the quality of education while others have argued that the rigidity of the labour market constrains employment growth. This paper considers the spatial aspects of the day labour market and argues that the size and proximity of economic activity found in agglomerations ensure a thick labour market that allows for better matching between workers and jobs. The results indicate that the day labourers who were hired by the same employer more often received higher earnings. Once workers have a matric qualification they receive earnings above the average, as do workers who have completed vocational training. Skills, as well as factors associated with a thicker labour market are positively associated with wages. The thicker metropolitan labour market allows workers to become more specialised and receive higher earnings. This has important policy implications and calls for the development of people and places. South Africa's unemployment rate is remarkably high and it is most visible in the form of the day labourers who stand at the side of the road or on street corners every day, waiting for any temporary job (Blaauw, Louw & Schenck, 2006:458). South Africa's informal sector is small compared to other developing countries and the observed unemployment is not voluntary (Kingdon & Knight, 2001). Devey, Skinner and Valodia (2002) found that income levels in the informal economy are very low, and race and gender are important determinants of income. This study extends the analysis by examining the correlates of earnings of day labourers, specifically the so-called thickness of the labour market. Standard explanations of labour market outcomes have focused on the attributes of individuals, specifically the importance of education, as well as on labour market characteristics and social networks. A few authors have also considered the spatial aspects of the labour market and recently Havemann and Kearney (2010) found that urbanisation is an important predictor of wage differentials in the formal sector. This paper expands this line of work by arguing in favour of the Smith-Marshallian view of agglomeration and the labour market. This approach holds that the size and proximity of economic activity found in cities and large towns ensure a thick labour market that allows for better matching between workers and jobs. Two models characterise this approach. Helsley and Strange (1990) showed that a large city allows for a better average match between heterogeneous workers and employers' job requirements and this enhances efficiency. On the other hand, Duranton (1998) argued that a large market allows workers to become more specialised and, therefore, to be more efficient. In both cases, greater efficiency increases workers' wages and this attracts more workers. Here the focus is on day labourers, drawing on a country-wide survey. Day labouring can be seen as a subset of the employee side of the informal economy in South Africa (Blaauw, 2010). Kingdon and Knight (2004) refer to subsectors of the informal sector and argue in favour of a broader view of informal employment than the traditional informal business- based approach (see also Fourie, 2011:18). The contribution of the paper is threefold: i) it uses a unique set of primary data collected in the idiosyncratic South African labour market, ii) it adds agglomeration to the labour market discourse, and iii) the geography goes beyond a rural-urban dummy or provincial-level analysis and includes district council-level population density, a measure of occupation density and interactions with a metropolitan areas dummy. The survey data allows us to estimate a cross-section regression model of the importance of the thickness of the labour market as a correlate of day labour wages, while controlling for individual-specific characteristics. The results show that individuals' education and skills, as well as factors associated with a thicker labour market, are positively associated with wages. This has important policy implications and calls for the development of people and places. The paper is structured as follows. Section 2 provides an overview of the theory of agglomeration and the labour market. A number of claims are identified and tested in the subsequent empirical analysis. We also review South African contributions that have considered the spatial aspects of the labour market. Section 3 presents a description of the survey and descriptive statistics of the data collected. The regression analysis is described and results are reported in Section 4. Section 5 concludes and makes recommendations. A wide variety of theories may be called upon to explain the location, specifically the agglomeration, of production in space. These range from the fields of urban economics, regional economics, trade and growth theories and development economics. The formal model of geographical economics was put forward by Krugman (1991) and discussed in detail by Brakman, Garretsen and van Marrewijk (2001) and Fujita and Thisse (2002). Preceding the mathematical models, Porter (1998) provided an intuitive explanation of the importance of the clustering of economic activity. A cluster is a critical mass of producers in a particular field, in a particular location - the result of the process of localisation. In clusters, the proximity of producers leads to spillovers that improve factor conditions. This improves the flow of information and the success of innovation. This is also true for related and supporting industries. They provide specialised inputs and information, and facilitate complementarities among firms. Materials, components, machinery and services are supplied more efficiently and at lower cost when producers are concentrated in a particular locality. Location plays a role in firm strategy and rivalry. Rivalry that involves imitation and differentiation improves competition and leads to growth. When firms are clustered together, rivalry is more intense. In the final instance, the demand conditions in a locality may influence the business environment, competition, and growth. Sophisticated and demanding customers at home press firms to improve and differentiate and a cluster may provide such a group of customers. Thus, Porter (1998) saw the enduring competitive advantages in a global economy as localised. Proximity allows for relationships, better information and other advantages in productivity and productivity growth. These reasons why firms locate close to one another has a corollary in the labour market. Proximity allows for better matching between workers and jobs. In this approach there are two models. Helsley and Strange (1990) showed that a large city allows for a better average match between heterogeneous workers and firms' job requirements and this enhances efficiency. On the other hand, Duranton (1998) argued that a large market allows workers to become more specialised and, therefore, to be more efficient. In both cases, the increased efficiency increases workers' wages. At the same time, workers find it less risky to be in locations with many possible employers. Empirical evidence shows that a doubling of economic density increases productivity by six per cent (Ciccone & Hall, 1996) and a doubling of employment density increases productivity by 4.5 to 5 per cent (Ciccone, 2002). In the case of South Africa, there are few studies that examine the spatial aspects of the labour market. Kingdon and Knight (2004) found that location matters for black unemployment on a national scale. In a later contribution, Kingdon and Knight (2006) examined wage responsiveness to local unemployment. At an aggregate level the difference between the increase in the labour force and the fall in formal sector employment grew rapidly over the period 1990 to 2000, suggesting that there was a positive relationship between wages and unemployment. 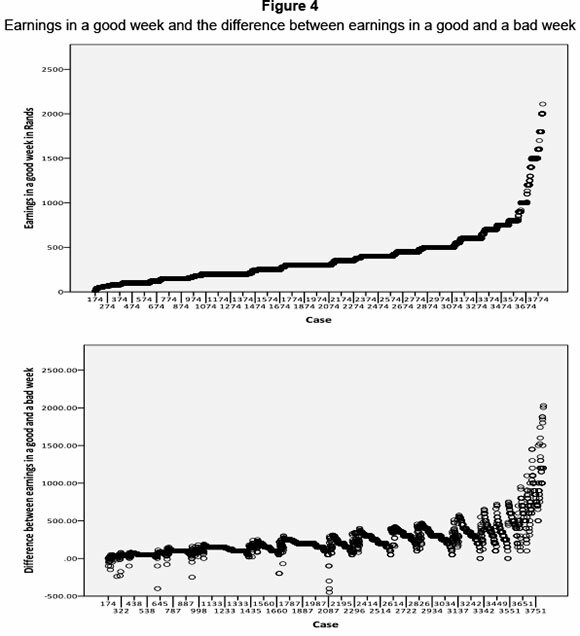 However, Kingdon and Knight's (2006) estimation of a wage curve across space indicated a negative relationship. The results showed that male, urban and married workers received significantly higher wages than female, rural, unmarried workers. They found that the distinction between rural and urban areas did not capture labour market segmentation well, but significant province dummies indicated regional variation in pay levels. It was also found that centralised bargaining insulates workers from local labour market conditions. Recently, Magruder (2010) examined the last result more closely by looking for spatial discontinuities in the enforcement of centralised bargaining agreements. He used a database of bargaining council agreements along with September Labour Force Survey data for the period 2000 to 2003 with magisterial districts as the spatial level of observation. The results show large spatial discontinuity effects: having a centralised bargaining agreement in a particular industry in a specific town causes employment to be 8 to 15 per cent lower and wages to be 10 to 21 per cent higher than in the same industry in an uncovered neighbouring town. Wittenberg (2001) examined the spatial dimension of unemployment by examining the role of neighbourhood networks. He used data from the 1995 October Household Survey and a distinction between urban and rural households. He found that some households are more successful at getting their members employed than others and there is a difference in these social effects between urban and rural areas. His spillover variable suggested that rural households have better neighbourhood networks that allow them to access labour market opportunities. A more recent contribution by Hofmeyr (2010) examined the link between social networks and ethnic occupa- tional niches in manufacturing. Employing data from the 2001 census, which allows for analysis at the level of magisterial districts, Hofmeyr (2010) used individuals' language groups and magisterial districts as a proxy for their social networks and found strong evidence of niche employment. The results showed that English and Afrikaans individuals are clustered in advantageous niches where monthly income and skill levels are relatively high. In a slightly different approach, work by Naudé (2008) examined the possibility of a spatial mismatch in the metropolitan labour market as an explanation of the differences in unemployment rates between the white and black populations. He used data from the 1996 and 2001 censuses and employed various methods measuring the extent of suburbanisation of the population and employment, examining the relationship between residential segregation and unemployment, analysing commuting distances and taking into account differences in earnings and education. The results showed that there exists a spatial mismatch between jobs and jobseekers and that distance from the city centre plays a significant role as a predictor of black unemployment. The latest contribution that examines spatial aspects of the South African labour market comes from Havemann and Kearney (2010) who argue that where you live matters for employment. They used 2001 census data to construct an urbanisation index at district council level and used it along with a range of individual-specific predictors of employment from the Labour Force Survey of March 2005. The results show a positive relationship between urbanisation and the probability of being employed. For example, someone in Johannesburg is 1.5 times more likely to be employed than a similar individual in a medium-sized town. Finally, there is only one recent study of day labourers. There are of course many contributions to the study of the informal economy, for example Devey et al. (2002), but there the focus is on a wider range of informal activities that falls outside the scope of this review. For the case of day labourers specifically, Harmse, Blaauw and Schenck (2009) examined inter-regional differences in the labour market and found clear differences. Day labourers were found to earn higher levels of income in cities and larger towns than in rural areas. Every city or town has sites where a labourer can earn more income than at other sites. Also, some sites draw together labourers with higher levels of skills. However, their focus was only on general levels of development and unemployment at the provincial and local municipality level. In summary it can be said that a literature of the spatial aspects of the labour market in South Africa exists and that it seems that location may influence labour market outcomes. This paper takes their analysis a step further by examining location as one of the correlates of earnings while controlling for a range of individual-specific characteristics of day labourers. The key claims to test are whether large urban areas do allow for a better match between workers and jobs, whether it allows for day labourers to become more specialised and if these factors contribute to higher earnings. 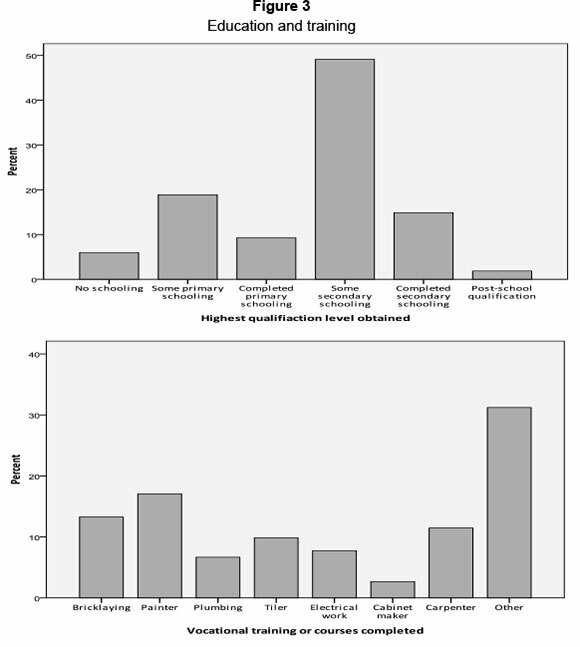 The following section describes the survey of day labourers (Harmse et al., 2009) through which the data were obtained. Section 4 presents the empirical analysis and results. Information from all available sources, for example municipalities, churches and other welfare organisations as well as the Department of Labour, was used to plan a systematic process to estimate the number of day labourers in South Africa. The two years preceding the survey were used to go around the country and physically count the number of day labourers in the various cities and towns and to conduct preliminary interviews. During this process the names of the streets where the day labourers congregated were recorded and the number of day labourers present at each site was counted. There are nearly 1,000 places in South Africa where a minimum of 45,000 mostly black African men stand and wait to be picked up for day labour (Harmse et al, 2009:4; Blaauw, 2010:75). Figure 1 illustrates the geographical distribution of day labourers in South Africa at the local municipality level at the time of the survey. A sample of between 5 and 10 per cent was appropriate to control for possible sampling error (De Vos, Strydom, Fouche & Delport, 2004:200). It was estimated that a total of between 2 500 and 4 000 interviews had to be conducted across South Africa in order to obtain a representative sample of the research population (Harmse et al., 2009; Blaauw, 2010:82). For this purpose, a detailed questionnaire was needed. The questionnaire that was used in the 2004 Pretoria survey (Blaauw et al., 2006) laid the foundation for the formulation of the questionnaire for conducting countrywide interviews. The questionnaire was designed in a multi-stage process. The draft was furthermore subjected to a trial run before the final adjustments were made. A dedicated fieldworker, who could speak several of the official languages of South Africa, was hired and she received extensive training. In the bigger metropolitan areas students in the Department of Social Work at UNISA were recruited and thoroughly trained as additional fieldworkers. The fieldwork commenced towards the end of February 2007 and was completed by the beginning of 2008 (Harmse et al., 2009). The sample was checked to ensure that the required proportionality in terms of the regional distribution was maintained (Blaauw, 2010:90). The results of the descriptive analysis and subsequent empirical work are presented in the next sections. This paper uses the responses to the survey of 3,812 day labourers. Of these, the majority were male (96 per cent) and Black (92 per cent). A quarter of the respondents were found in the Gauteng province, 16 per cent in the Western Cape, 14 per cent in KwaZulu-Natal and 11 per cent in the Eastern Cape province. 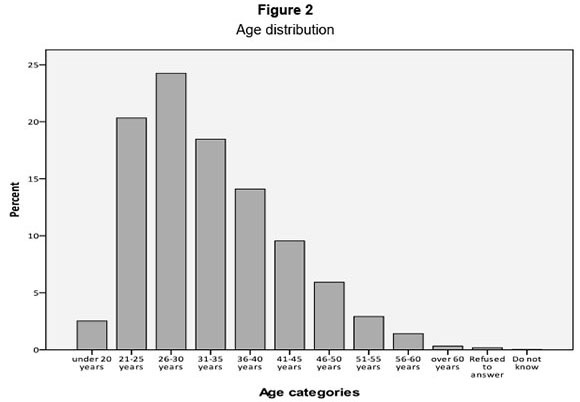 Figure 2 shows the age distribution of the respondents. Most of the day labourers surveyed were between 20 and 40 years of age. Only 2.5 per cent were younger than 20 years and only 4.8 per cent were older than 50 years. Figure 3 shows the day labourers' highest qualification level obtained and the vocational or training courses that they had completed. It is clear that most of the day labourers (49 per cent) had some secondary schooling and approximately 15 per cent had completed their secondary schooling. In terms of training or courses completed, 13 per cent indicated that they had completed a bricklaying course, 17 per cent a painter's course and 11 per cent had carpentry training. Approximately 31 per cent indicated that they had other training or courses completed. A cross tabulation of the qualifications and training measures shows a correspondence between higher levels of education and the more high-skilled vocational training. Day labourers who had some secondary schooling had also completed courses in bricklaying (15.8 per cent) and painting (14.3 per cent). Some that completed secondary school also had training as carpen-ters (14.8 per cent), or tilers (13.3 per cent). Of the total group surveyed, 51 per cent indicated that they had at one time held a fulltime job. They were also asked how frequently the same employer hired them for three days or more. Half indicated that this seldom happened, while almost a quarter said that it happened sometimes and 15 per cent said that it happens often. The questionnaire also asked what kind of jobs they had as a day labourer in the last month. The interviewers marked the kind of jobs that were mentioned on a list of 20 possibilities and an 'other' option. On average, the workers mentioned three kinds of jobs that they had in the last month. Table 1 shows the results. Table 1 shows the number of day labourers and the kind of jobs that they had over the previous month. It seems that they specialise and it is possible to characterise the worker by the type of jobs, or by the skills and experience required for the types of jobs. The groupings, indicated by the light and dark shading, are from principle component analysis, showing the types of jobs that are related. The complete set of results of the principle component analysis is presented in Appendix A. It is clear that different kinds of jobs are done by different kinds of day labourers and there are clear differences in earnings. Painter's assistant (16.5 per cent) and "other" jobs (15.4 per cent) are the largest categories. Their average earnings are close to the average earnings of all the day labourers. Lower skilled jobs that are likely to provide smaller returns to training and experience, include jobs such as bricklaying assistant, construction clean up, digging and shovelling and loading and unloading. Domestic work, car washing and farming activities are grouped together and make up 17.9 per cent of jobs held while receiving below-average earnings. The different construction activities are clearly grouped by the skills required. Some workers do the bricklaying, plastering and painting, electricians and their assistants are a group on their own, while others do carpentry and roofing and work as plumbing assistants. On average all these day labourers had been working in such jobs for almost four years. The survey also asked the labourers how much they earned during a good and a bad week. For the group as a whole, earnings in a good week averaged R386 and R163 in a bad week. Figure 4 shows a scatter of the earnings in a good week and the difference between earnings in a good and a bad week. The observations are sorted from low to high earnings in a good week. It is clear that there is a significant spread of values around the mean of R386 - the standard deviation is R304. When a bad week's earnings are brought into the picture, the spread widens, particularly among those day labourers that earn above average in a good week. The variation in earnings from the average is what this paper wants to focus on and there are many interesting differences. Table 2 presents the means of earnings in a good week, split by a number of possible correlates. Examination of the age distribution shows that those day labourers between the ages of 26 and 45 generally receive above average incomes, while younger and older workers receive incomes below the average. Some of the variation in earnings is due to level of education. 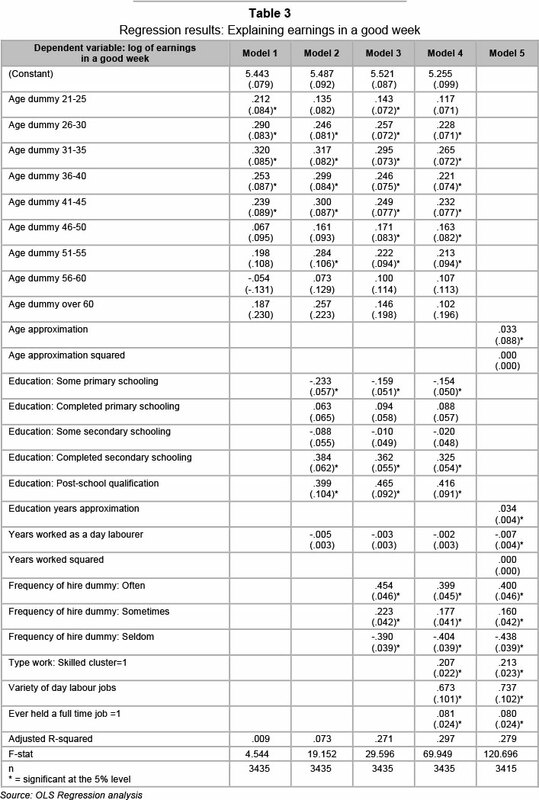 Table 2 shows that day labourers who have completed secondary school or have a post-school qualification have substantially higher earnings in a good week. All the workers who have completed vocational training or a course of some kind receive earnings above the average. Surprisingly, workers that have never held a full-time job, on average, receive higher incomes than those that have held a full-time job. This may well be an indication that social and psychological aspects also influence these labour market outcomes. A day labourer who was used to more stable employment may be more despondent and therefore not look for employment with the same vigour as his colleague who never had anything better in terms of previous employment. It may be that they do not have the same networks of employment information. This opens the opportunity for in-depth qualitative interviews and focus group discussions with day labourers to verify these hypotheses. As day labourers, those that are often hired by the same employers for three or more days, earn much higher incomes. The type of work done also helps to explain the variation in earnings. Table 1 showed that bricklayers, electricians, carpenters, painters and those in roofing do substantially better than their assistants. Digging and shovelling, carpenter's assistants, roofing assistants, car washing, plastering, electrician's assistants and plumbers also receive above average incomes in a good week. 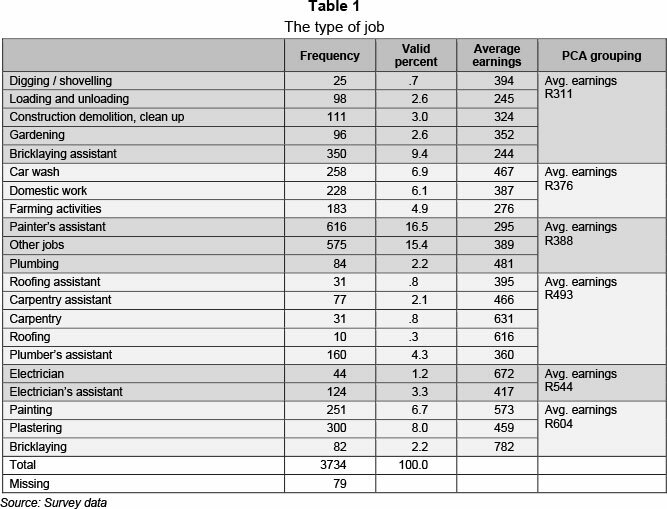 Where principle component analysis was used to group the different types of jobs done by different day labourers, it is possible to use cluster analysis to regroup those labourers by earnings and types of jobs. Simple two-step cluster analysis reveals two distinct clusters. Cluster 1 consists of the more unskilled jobs such as loading and unloading, construction demolition and clean-up, domestic work, car wash and gardening, as well as farming activities. It also includes work as an assistant, such as bricklaying assistant, painting assistant, and plumbing assistant. Cluster 2 consists of the hard physical labour of digging and shovelling and the more skilled construction jobs such as bricklaying, roofing, roofing assistant, carpentry, carpentry assistant, painting, electrician, electrician assistant and plastering. The difference in earnings is as expected, with the workers in more unskilled jobs receiving below average earnings and those in more skilled jobs receiving above average income in a good week. In section 2 it was argued that large urban areas do allow for a better match between workers and jobs, and this allows day labourers to become more specialised. A cross tabulation of the frequency of employment and metropolitan areas indicator shows that in metro areas 22 per cent of day labourers are often hired by the same employer for more than three days, compared to 13 per cent in other areas. When one considers the variety of jobs done by day labourers (the number of jobs that they reported doing as a proportion of the total of twenty job types), those in metro areas are more specialised. They have a variety mean of 0.117 with a standard deviation of 0.082, whereas those workers elsewhere have a variety mean of 0.178 and a standard deviation of 0.113. Table 2 shows that location may also matter as a possible explanation of the variation in earnings. Day labourers in the Western Cape, Gauteng and KwaZulu-Natal receive above average earnings in a good week, whereas those in the Limpopo Province, the Free State and Northern Cape do particularly poorly. The metropolitan areas indicator in Table 2 shows that labourers in Gauteng, which includes Johannesburg, the greater Tshwane and Ekurhuleni, along with those in the greater Cape Town, Durban/eThekwini and Nelson Mandela Bay metropolitan areas, earn above average incomes compared to those in the rest of the country. 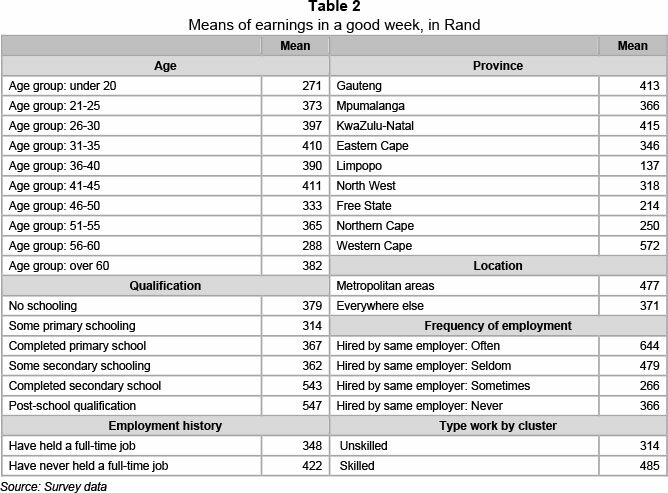 From the above description of the survey data it is clear that there are interesting differences in the earnings of day labourers in South Africa. To take the analysis a step further, the following section presents the results of regression models of the correlates of earnings. In the econometric model that follows, day labourers' earnings per week2 are examined as a function of a range of factors. In the analysis, earnings are measured as the natural log of earnings per week. The first two models are similar to Mincerian wage equations. Here age is included since day labouring involves hard physical labour and one would expect that younger, stronger labourers would earn more. The age variable is a dummy where "age under 20 years" is the comparator category. Education is also a dummy variable where the comparison is with labourers with no schooling. Experience as a day labourer is measured by the experience variable in years. The variable frequency of hire measures the frequency with which the day labourer is hired by the same employer for more than three days. However, this does not mean that those workers are necessarily hired more frequently, thereby introducing a possible implicit endogeneity problem, only that they are hired by the same employer more often. The comparison category is those labourers that never get hired by the same employer more than three times. Typejob is a dummy variable that distinguishes between the two types of jobs identified by cluster analysis. The more skilled cluster-2 jobs are compared to the less skilled cluster-1 jobs. 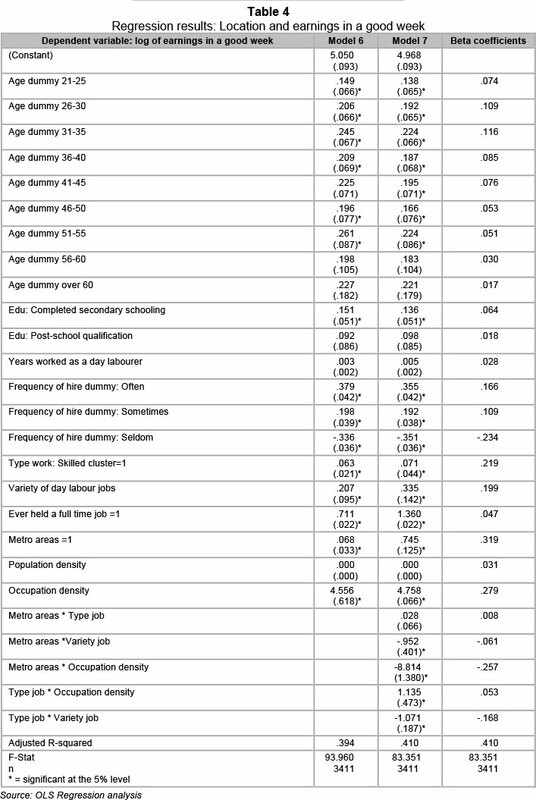 Day labourers typically do more than one job and the variable varietyjob measures the number of jobs that they reported doing as a proportion of the total of twenty job types. The variable fulltimejob is a dummy variable that takes a value of one if the day labourer has ever held a full-time job. The model is estimated by OLS. Table 3 presents a first round of results. The reported standard errors are robust to heteroskedasticity and the variance inflation factors are all less than 10. Model 1 contains only the age dummies. Compared to the day labourers younger than 20 years, earnings in a good week increase with age. For those older than 45 the coefficients are smaller but still positive (this is also the case for Beta coefficients). The coefficient for the age group 56 to 60 years is negative, which means that this group earns less in a good week compared to the day labourers younger than 20 years. These decreasing returns do not hold for the day labourers older than 60 years, who have a positive coefficient. However, this may be explained by a cross-tabulation of age categories and the type of work by cluster which showed that this is the only group where there are more workers doing skilled work than unskilled work. In model 2 education and experience is added. Though there is a positive relationship between age and earnings, experience in terms of the number of years worked as a day labourer, is negatively related to earnings, but insignificant. This holds true even when the age dummies are not included. The education dummies have the day labourers with no schooling as the comparator category. It seems that compared to having no schooling, having some primary schooling is negatively associated with earnings. Having completed primary school is positively associated with earnings, but it is insignificant. However, having only some secondary schooling is again negatively associated with earnings, compared to having no schooling. There are positive and significant relationships between earnings and completed secondary schooling as well as between earnings and post-school qualifications. This seems to correspond with Fourie's (2011) observation that education level is positively and significantly associated with employment only once persons have a matric qualification or higher. Note that once education is included the negative relationship between earnings and the age group 56 to 60 years changes, but is insignificant. Version 3 of the model is extended further through the inclusion of the frequency of hire dummies. Compared to those that are never hired by the same employer, day labourers that are often hired by the same employer for more than three days earn more. There is a negative relationship between earnings and being seldom hired by the same employer, compared to those that are never hired by the same employer. Model 4 is the most complete model and also includes the typejob, varietyjob and fulltimejob variables. Doing jobs in the skilled cluster is positively associated with earnings. Table 3 shows that there is a positive and significant relationship between earnings in a good week and doing more jobs. Having held a full-time job at some stage is also positively and significantly associated with earnings. Model 4 explains approximately 29 per cent of the variance of earnings in a good week. 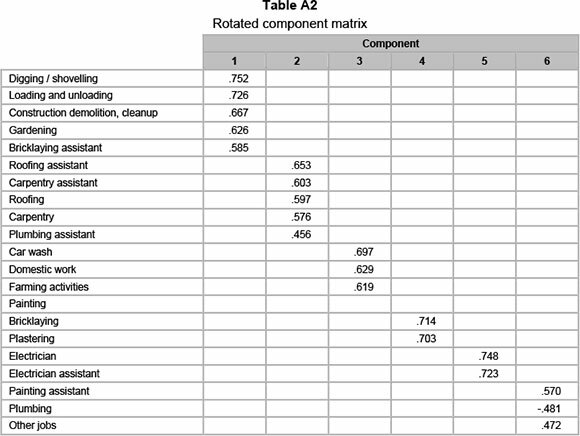 Model 5 in Table 3 is an approximation of the more typical Mincerian form of the wage equation. The age dummies are replaced by the category midpoints in years and an age-squared term is calculated. The number of years of education is approximated in the same fashion. Experience is measured in years and a squared term is also added here. Experience in this case does not refer to age minus education minus six years, but merely the number of years a person has been working as a day labourer. The correlation between age and experience would be relatively low in this case. This allows one to include them in the same model. The rest of the model remains as in version 4. This does not seem to change the results substantively. The age-squared and experience-squared terms have coefficients of zero and the other relationships remain practically unchanged. A key argument of this paper is about where the day labourers are. It isargued that large urban areas do allow for a better match between workers and jobs, and this allows day labourers to become more specialised. The data that are available precludes the estimation of spatial wage equations (see, for example, Garretsen, Schramm, & Brakman's (2003) Helpman-Hanson model), but there are a number of ways to test whether location matters. To do this, the above model 4 was supplemented with explanatory variables. At the most basic level it is possible to add controls for location. Model 6 below includes measures of the thickness of the labour market. The metro dummy indicates whether the day labourer works in a metropolitan city or not. The location of the day labourers can be identified at district council level and thus population density can be included as a measure of agglomeration. The data are from Global insight's Regional Economic Explorer database. A measure of occupation density was also constructed. This measures the number of day labourers per type of work (skilled or unskilled) per district council, for each of the respondents. Greater occupation density means more people doing the type of work you are doing, where you are doing it. For all three of these variables the theory in section 2 would predict a positive relationship with earnings in a good week. To test the claims that a thick labour market allows for better matching and specialisation, it is also possible to examine some interactions. Model 7 below includes a number of interactions: metro*typejob, metro* varietyjob, metro*occudensity, typejob*occuden- sity and typejob*varietyjob. Again, the reported standard errors are robust to heteroskedasticity and the variance inflation factors are all less than 10. The results of model 6 show that the location variables add significantly to the explanatory power of the model. The results are similar to that of model 4 above, save for the fact that experience, or the years worked as a day labourer, is now positively (if insignificantly) associated with earnings. The metro dummy is positive and significantly related to earnings. Unfortunately the coefficient of the population density variable is practically zero, but greater occupation density is positively and significantly associated with earnings. Adding the interaction terms to model 7 produces results are a comparable to those discussed above. The coefficients on the interaction terms can be interpreted as follows. The metro*typejob interaction is positively related to earnings. This means that day labourers in metropolitan areas that do skilled jobs earn more. In metropolitan areas doing a greater variety of jobs is negatively associated with earnings. This may be support of Duranton's (1998) idea that a thick labour market may allow workers to become more specialised. However, in metropolitan areas greater occupation density is also negatively associated with earnings, which reflects the competition for jobs amongst day labourers in the big cities. Recent increases in the number of day labourers in South Africa's major cities following the global downturn and slower growth in the construction industry will increase this level of competition even further. The interaction of typejob with occudensity indicates that for skilled workers (compared to unskilled workers), greater occupation density is positively related to earnings. However, skilled workers need to specialise. The interaction of typejob and varietyjob shows that if skilled workers do a greater variety of jobs, it is negatively related to earnings. The final column in Table 4 also reports standardised beta coefficients for model 7. These can be interpreted as the change in the log of earnings in a good week for a one standard deviation change in the particular independent variable. The benefit of standardised betas is that they allow for comparison of coefficients. This means that the largest positive relationships with earnings in a good week are with working in a metropolitan area, doing skilled work, being hired by the same employer more often and doing a greater variety of jobs. However, doing a greater variety of jobs is only better for unskilled workers as skilled workers are better off specialising. In this model, working in a metropolitan area and being hired by the same employer more often are more important than education. The largest negative relationship with earnings in a good week is with the competition from other workers in metropolitan areas. To check the robustness of the results, the same models were estimated to explain the difference in earnings between a good and a bad week and also only the earnings in a bad week. The results were broadly similar and are not reported here. This paper examined the employment of day labourers across South Africa to establish whether the thickness of the labour market determines earnings. The key claims to test were whether large urban areas allow for a better match between workers and jobs, whether it allows for day labourers to become more specialised and if these factors contribute to higher earnings. The regression models examined location as one of the correlates of earnings while controlling for a range of individual specific characteristics of day labourers. It is important to keep the limitations of the analysis in mind. Since only a single cross-section of data is available it is not possible to control for unobserved heterogeneity as one would in panel data models. The results cannot speak to causality, but it is possible to examine the direction of relationships and to determine how much of the variance of the dependent variable is explained by the independent variables. If it were the case that more able workers select themselves into the larger urban areas, these results over-estimate the importance of agglomeration. This possible upward bias in the coefficient of the metro dummy is however ameliorated by the results of the other interaction terms which support the notion that the thicker metropolitan labour market allows workers to become more specialised and receive higher earnings. Furthermore, the interviews with the day labourers, in terms of their origin, suggest a general migration from poorer provinces to the wealthier economic powerhouse provinces such as the Western Cape and Gauteng. The aim is to improve their chances of being hired as day labourers and earn higher levels of income for their services. This migration is not limited to the more skilled day labourers, but is a general demographic feature of the sample population. The results show that education is positively associated with earnings once workers have a matric qualification, and all the workers who have completed vocational training receive earnings above the average. Higher skilled jobs are also positively related to earnings. Years of experience working as a day labourer do not seem to contribute to earnings, but having had a full-time job at one time does contribute to earnings. There was some evidence of the thickness of the labour market's association with earnings. Throughout, the day labourers who were hired by the same employer more often received higher earnings. This is indicative of a better match between workers and jobs that increases earnings. Of course there is the possibility that it also captures unobserved effects such as ability or commitment. There was a positive relationship between earnings in a good week and doing more jobs. Labourers seemed to benefit from diversification rather than specialisation. However, when the metropolitan areas dummy is interacted with variety the results favour specialisation, and diversifying into doing more jobs is negatively associated with earnings in a good week. Thus it seems that the thicker metropolitan labour market allows workers to become more specialised and, therefore, to be more efficient. The increased efficiency is positively associated with workers' wages. Throughout, the dummy for metropolitan areas was positive and significant. The conclusion is that the thickness of the labour market matters for day labourers. Though this conclusion may seem obvious, the implications are not. More often than not, analyses of employment and unemployment in South Africa conclude with calls for the development of people, with emphasis on the importance of education and training. When it comes to the informal sector, issues such as labour market institutions, regulation and access to training and finance are mentioned. The results here have shown that education, vocational training and the ability to do higher skilled jobs are positively associated with earnings in the day labour market of the informal economy of South Africa. However, it is also clear that these advantages are better leveraged in the thick labour markets offered by urban agglomerations. This has significant implications for spatial development. The 2009 World Development Report stated that markets shape the economic landscape, but spatially targeted interventions tend to dominate policy discussions. The report argues that in the face of market forces, such interventions tend to be inefficient. Policymakers should rather focus on creating and supporting spatially blind institutions and spatially connective infrastructure (World Bank, 2009). For South Africa this all means more rapid urbanisation and a need to facilitate the mobility of people. Urban transformation, infrastructure development and service delivery raise a host of challenges beyond the labour market. WITTENBERG, M. 2001. Spatial dimensions of unemployment. Paper presented at the DPRU/FES conference 'Labour markets and poverty in South Africa', Johannesburg, 15-16 November 2001. 1 The authors would like to thank an anonymous ERSA referee, two anonymous referees of SAJEMS as well as participants at ERSA's 2011 Public Economics workshop for their helpful comments on earlier versions of the paper. The authors wish to acknowledge Economic Research Southern Africa (ERSA) for financial assistance with this research paper. All errors and omissions remain our own. 2 Day labourers have to contend with low and variable levels of income as well as highly irregular hiring patterns (Blaauw, 2010). The data reveals that the variance in the distribution is not as pronounced for weekly income as it was for the monthly income of day labourers in Pretoria in 2004 (Blaauw et al., 2006:267). This guided the authors to make use of weekly income for the analysis. The income in a good week is the best possible scenario for the day labourers and therefore used in the present analysis. The appendix shows the results of the principle component analysis. Field (2005) states that a KMO test score close to 0.8 indicates that the data is suitable forprinciple component analysis. Bartletts test is significant. Varimax rotation was used with Kaizer normalisation. The extracted components explain 46 percent of the variance of the different types of jobs.